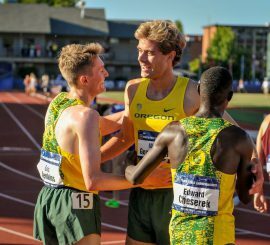 What was supposed to be a close team race turned into a romp as the Oregon Men’s Track & Field Team ran away with a second straight NCAA Outdoor title. The Ducks racked up 85 points to outdistance second place Florida with 56. 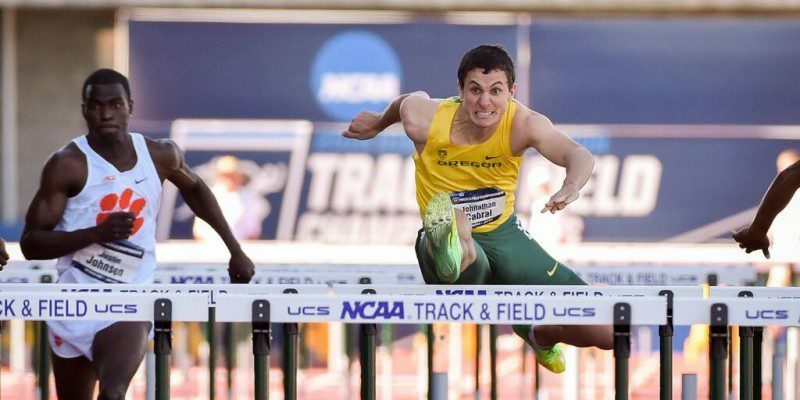 Track & Field News had projected Oregon to win by two. Blake Haney rides a wild sprint to the finish for third in the 1500. 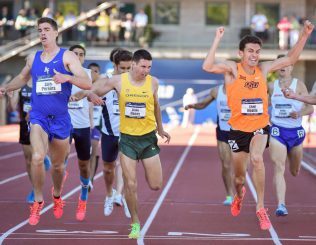 Arkansas, LSU and USC rounded out the top five finishers, but the day clearly belonged to the Ducks. Freshman Blake Haney set the tone for the day for the Ducks with a third place finish in the 1500, finishing strong in 3:55.12 in what turned out to be a slow-paced strategic race with a wild sprint at the finish. Johnathan Cabral hit a fast personal record to take second in the 110 hurdles in 13.22 and Marcus Chambers added another second place finish in the 400 with a time of 45.59. Meanwhile, Florida’s men were dropping positions in the finals right and left. After disappointing Gator finishes in the 400, 800 and 400 hurdles, it was game over. Florida had three more chances to score, but with first places being worth 10 points, the most possible was 30, and they trailed the Ducks by 34. Ducks celebrate a 1-2-4 finish in the 5K. The Gators did pick up 28 out of the possible 30 to finish with 56 points, but the Ducks were far from done scoring themselves. Projected to go 1-2 in the 5000 meters for an additional 18 points, the Ducks did one better and went 1-2-4 to complete the blowout. As was the case in the 10K on Wednesday, Edward Cheserek and Eric Jenkins sat back and toyed with the field before blowing apart the race in the final 800 meters. The only difference was that this time they were joined by fellow Duck Will Geohegan two places back in fourth. Cheserek finished in 13:48.67, Jenkins in 13:48.92 Geohegan in 13:49.35, barely missing a 1-2-3 sweep. The Ducks women face a tougher road Saturday, locked in a tight two-way battle with Texas A & M for the team crown. Action begins with field events at 1:30 and the first race on the track begins at 2:05.